Frieze Art Fair May 2017 Galaria Casa Triângulo. Juliana Cerqueira Leite exhibits two new sculptures Cinq à Sept 1 and 2, 2017 inspired by Cléo, the main character in Agnes Varda's Cléo de 5 a 7. After engaging themes of the simulacra surrounding Hari's character in Solaris for her recent exhibition at Alma Zevi in Venice Cerqueira Leite formally explores the representation of the female character in this thoughtful film by Varda. 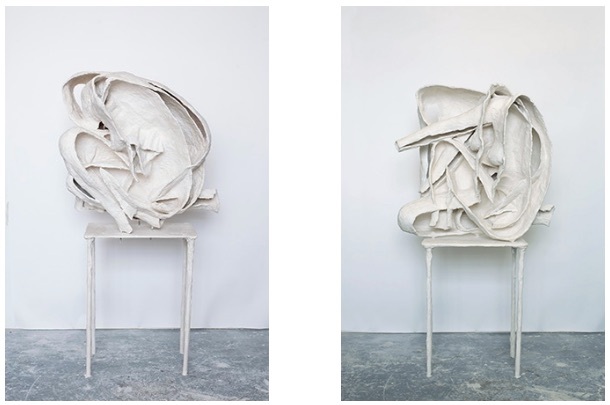 The works are composed of plaster body casts and molds that lean and support themselves on each other. 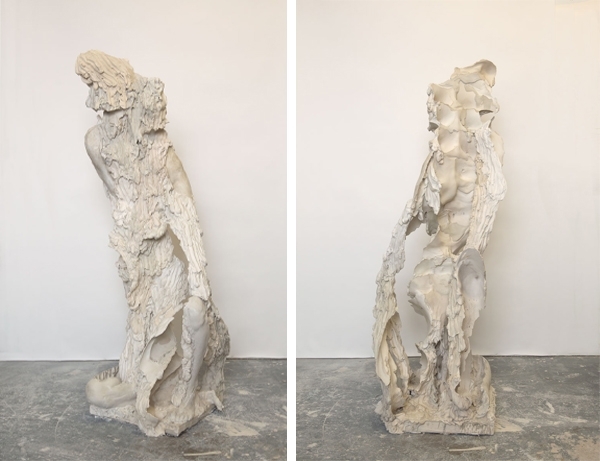 This is the first time that Cerqueira Leite has cast directly into the plaster that she pour onto her body, creating actual replicas of body parts and then chiseling away the poured plaster which acts as a mold. This visual flipping from mold to cast and from negative to positive is partly inspired by Varda's flipping of perspective in her film where we mostly see Cléo through the eyes of others then, after the middle of the film, start to see the world through her eyes as she attempts to reconstruct herself as a woman while dealing with a potential diagnosis of cancer and her fear of death. Exhibited alongside these new works are Curl 1 and Curl 2, 2013. These works were produced at a time when the artist recently had surgery for a work related injury and was partly unable to move normally for several months.